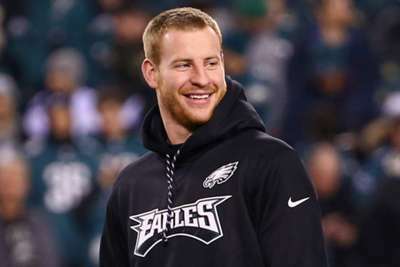 The Philadelphia Eagles are looking to agree on a long-term deal with star quarterback Carson Wentz, according to vice-president Howie Roseman. Wentz is entering his fourth year in the NFL. Injuries late in the season have forced him to miss significant time in the playoffs, including the Eagles' Super Bowl LII victory. The 26-year-old threw for 3,074 yards and 21 touchdowns in 11 games last season before being shut down with a back injury. Wentz has been replaced by Nick Foles in the playoffs for the past two seasons. But, the latter signed a four-year, $88million deal with the Jacksonville Jaguars earlier this month. "We're incredibly optimistic about the 2019 season," Roseman said. "Having Carson here long term is our goal, and we’re working toward that." Philadelphia finished 2018 at 9-7 and fell to New the Orleans Saints in the divisional round of the playoffs. "We think we've added talent to our football team, continue to look for ways to add talent to our team," Roseman said. "But at the same time, we have to be realistic about the fact that we have a quarterback that we want to pay … and how we're going to build our team with that player, which is exciting for us. "I mean, we want to have a team led by a franchise-type quarterback. We know that we have that in Carson, and so now what are we going to do around him to make sure that we can continue to have [a great team]?"